The Boston sports scene has not been pretty over the past week. I detailed the heartbreak in a post I wrote yesterday. Therefore, I will not speak about it again. Instead, I write about the first place Boston Red Sox, who have made life a little bit easier in Boston despite what has gone on recently. Only the Pittsburgh Pirates have more wins than the Red Sox this season. Most of the so-called experts penciled the Red Sox in for 84 wins this season. Amazing enough, they are just 19 wins away from equaling last season’s total of 69. Everyone, including myself, have been waiting for the Red Sox to taper off a bit. The same can be said for Jose Iglesias who is sporting an amazing .409 batting average. Iglesias will have to go 0 for his next 40 to be at .300. With Will Middlebrooks struggling to hit the Mendoza Line (.200), Iglesias has shifted over to third base while Will figures things out in Pawtucket. I fully expect Middlebrooks back with the big league squad by the end of July. This is a guy who hit 15 home runs with 54 runs batted in, playing in just 75 games last season. I believe the third base- shortstop situation will figure itself out over the course of time. Stephen Drew has the month of July to get it together or else we may be looking at Middlebrooks and Iglesias on the left side of the infield. Heck, we might even see Xander Bogaerts playing a prominent role in August. Jon Morosi tweeted he believes Dustin Pedroia is the first half MVP in the American League. Anyone who knows me knows I am the biggest Pedroia blowhard dead or alive. Obviously, Miguel Cabrera is the MVP in the first half of this season. But I did become curious. 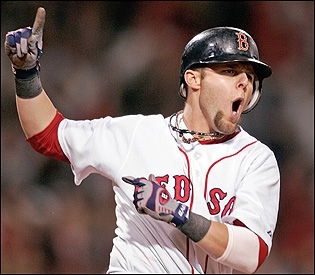 In Pedroia’s 2008 MVP season, he played in 157 games hitting .326 with 17 home runs and 83 runs batted in. He led the league in runs (118), hits (218), and doubles (54). He also won the Gold Glove award. This season, Pedroia is on pace to play in 160 games. He is projected to hit .322 with 10 home runs and 91 runs batted in. He is projected to score 102 runs, 201 hits, and 42 doubles. He will obviously win the Gold Glove this year. I will never argue with anyone that says Pedroia is a top 5 player in all of baseball. Jonny Gomes stats may not look all that great. He is hitting .218 with 5 home runs and 2o runs batted in playing in a limited fashion. But I feel whenever Gomes comes up in a big spot, he produces. When he is pinch-hitting, he is 4-12 with 2 home runs and 3 runs batted in. He is hitting .321 with runners in scoring position. Sure, he may be overpaid. But it’s not my money. And I love the energy he brings to the dugout. Don’t think for a second he is not a big part of the resurgent Boston Red Sox. Lastly, how awesome has John Lackey been? Never did I think I would say that. I have easily been his harshest critic during his time in Boston. But Lackey has been a bulldog for the Red Sox going deep into games when the team needs him to. I know I am stunned too. But I won’t complain. I am not ready to take back all the horrid things I said about him over the last three years but I will acknowledge his recent success. The 34-year-old has an ERA under 3 and has been a stopper while Clay Buchholz has been hurt and Jon Lester has been struggling. Lackey has been a pleasant surprise and I hope he can keep it up!